NETWORK FINALS: SURVIVOR gained 0.1 in final numbers, and as expected, the CW reruns both lost the same. CABLE HIGHLIGHTS: Comedy Central’s SOUTH PARK led Wednesday cable, up 0.07 to 0.76, with BROAD CITY up 0.07 to 0.40, which was a big enough lead-in to propel THE DAILY SHOW into a rare Top 5 slot at 0.39, followed by THE OPPOSITION with a 0.05 bump from Tuesday to 0.21. TBS’s FULL FRONTAL rose 0.05 to 0.42. On Food Network, WORST COOKS IN AMERICA jumped a tenth to 0.39, and BEST BAKER IN AMERICA debuted at 0.24. 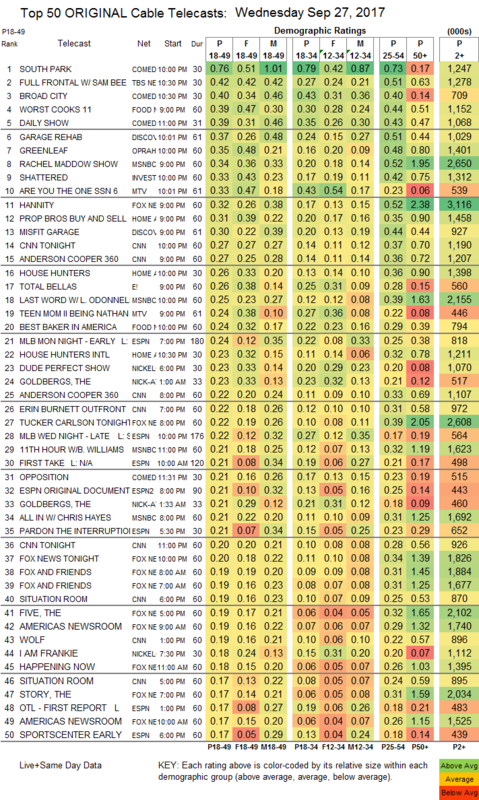 On Discovery, GARAGE REHAB edged up 0.02 to 0.37, and MISFIT GARAGE ticked down to 0.30. The season finale of OWN’s GREENLEAF fell 0.06 to 0.35. It’s still neck-and-neck for MSNBC’s RACHEL MADDOW SHOW and Fox News’s HANNITY with all but the oldest demo, with Maddow at 0.34/0.52/2.7M (18-49/25-54/total viewers) and Hannity at 0.32/0.52/3.1M, as CNN’s CNN TONIGHT lagged with 0.27/0.37/1.2M. On ID, SHATTERED was steady at 0.33. MTV’s ARE YOU THE ONE climbed 0.07 to 0.33, preceded by a special TEEN MOM, which was down three-tenths from last Wednesday. On HGTV, PROPERTY BROTHERS ticked up to 0.31, HOUSE HUNTERS dropped 0.06 to 0.26, and HOUSE HUNTERS INTL was down 0.07 to 0.234. 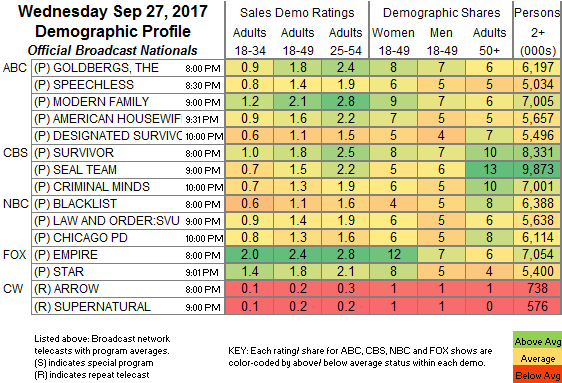 E!’s TOTAL BELLAS rose 0.02 to 0.26, and ERIC & JESSIE: GAME ON ticked up to 0.16. Syfy’s CHANNEL ZERO was at 0.11, compared to last week’s 0.14/0.09. Tru’s COMEDY KNOCKOUT lost 0.02 to 0.11. FXX’s YOU’RE THE WORST dropped 0.05 to 0.09. IFC’s BARONESS VON SKETCH SHOW held at 0.03/127K.